ST. LOUIS—During Sunday’s game against the St. Louis Rams, Washington Redskins fans across the country were reportedly having an extremely difficult time remembering how to cheer for a quarterback. 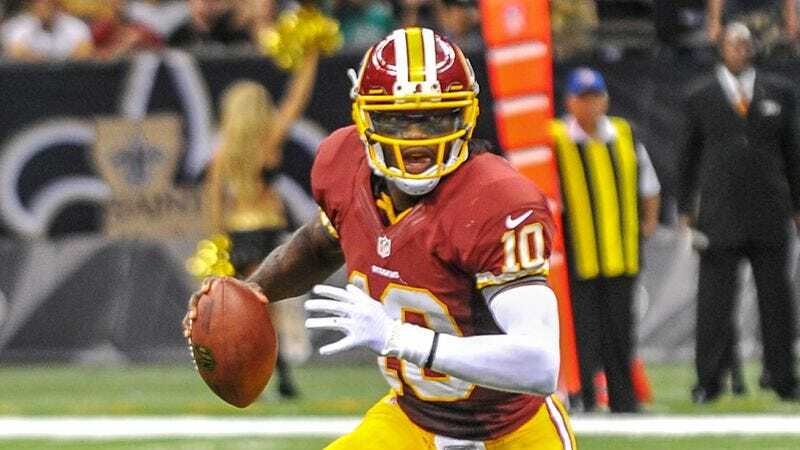 “So wait, what I am supposed to yell when he’s on the field?” said longtime fan David Fenners, 47, adding that he “completely blanks” on how to conduct himself when Redskins rookie quarterback Robert Griffin III completes a pass, scrambles for a gain, or throws for a touchdown. “It’s something like ‘Go!’ or ‘Throw!’ right? Or maybe I’m just supposed to clap. I haven’t actually cheered for a quarterback since Mark Rypien, and that was like 20 years ago, so I honestly don’t remember what I’m supposed to do here.” At press time, confused Redskins fans were booing Griffin until they could think of something better to do.